On March 31, 2018 current SUMA student Lucas Piazza, conducted the “Data Visualization for the Everyday (Wo)Man” workshop in which he drew upon his experience turning data into visual stories to teach the easy-to-employ secrets of good data visualizations. This workshop emphasized practicality over theory to ensure every attendee walk away with the knowledge that can be immediately used. As a communications professional for a NYC-based data startup, Lucas Piazza knows the power of data visualizations. Design, done correctly, is a universal language that has the power to make highly complex information relevant to an audience. Update 6/2/18: We’re so excited to announce that one of the teams from our Design Thinking Workshop won the Net Impact’s Drawdown INNOVATE challenge! They were invited to the 2018 Net Impact Accelerator in Oakland, CA and competed with other finalists for a cash prize. Congratulations Jenna Lewein, Matt Akins, and Merlyn Mathew! Additionally, Merlyn has received an internship from a sponsor. On March 21, 2018 we conducted a mid-term review of the four projects for Spring 2018. Each team presented their findings and next steps to complete their project. On March 3rd, 2018, we had an incredible workshop led by Of Course Global, where we learned about design thinking and how to apply it to climate change solutions for Net Impact‘s Drawdown INNOVATE challenge! A contest that gave winners an opportunity to further develop their concept through an accelerator program in San Francisco, internship, or cash prize. On February 27, 2018, SUMA Net Impact invited project teams to learn about current SUMA student’s, Aharon Kestenbaum, professional work with the NYC Department of Education’s zero waste initiatives. It was allowed our Columbia Environmental Stewardship project team to discuss their current project findings and future deliverables. This event will feature senior consultants from: SustainAbility, Accenture Sustainability Services, Ernst & Young Sustainability Services, and BSR. This is a great opportunity to learn about the sustainability consulting space and engage with consultants from top-tier firms. Discussion topics will include: the type of work done by each firm, a day in the life of a sustainability consultant, interesting projects, industry trends, the recruiting process, etc. – the goal is to expose attendees to the industry. Everyone is invited to join the organizers and panelists for drinks following the event! 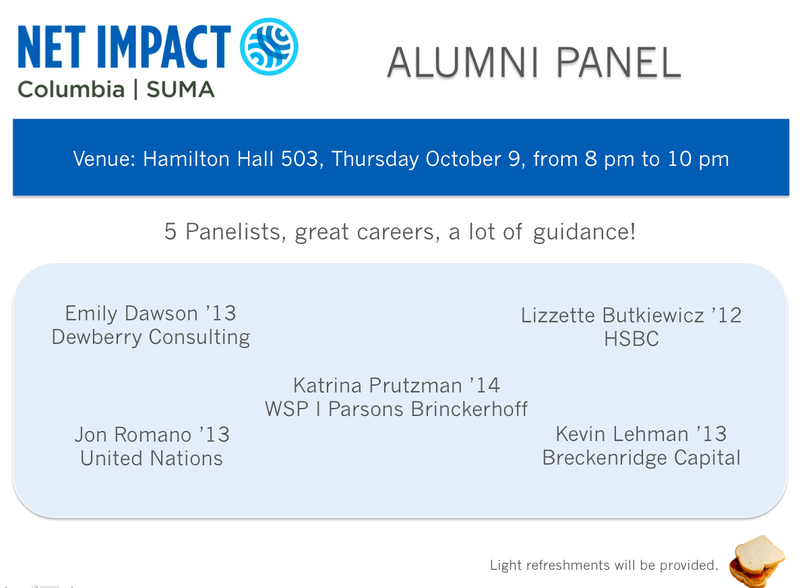 Join us, this Thursday at the Alumni Panel Event! 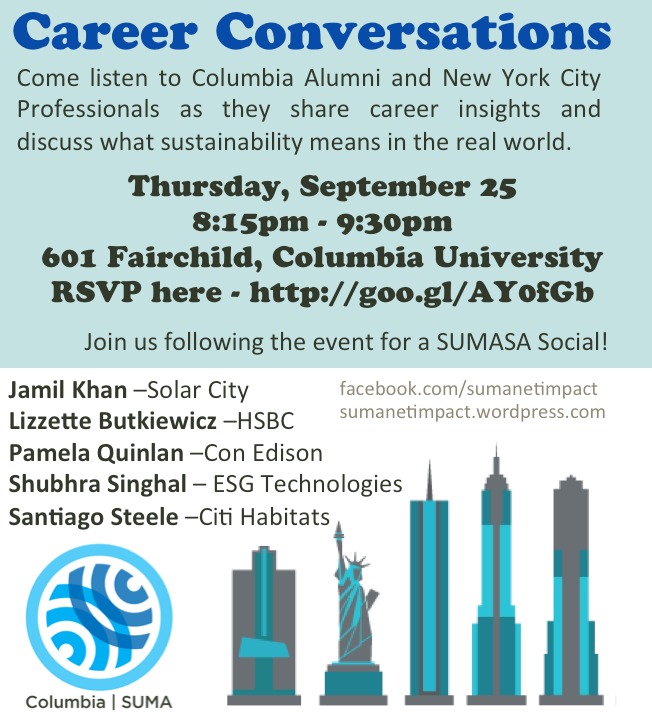 Attention students and alumni: Join us this upcoming Thursday, at the SUMANI Alumni Panel event! With a growing network of SUMA alumni, this panel discussion will include discussions about transitions from life as a SUMA student to becoming a professional working in the field of sustainability.